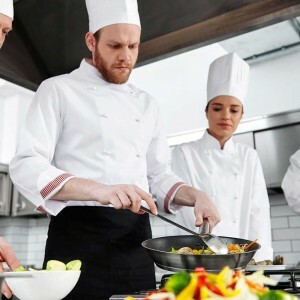 Aspects To Consider For Your Restaurant's Employee Uniforms | Ace Uniform Services, Inc.
Have you considered the following for your restaurant’s employee uniforms? Are you a restaurant owner? Did you know that your staff’s uniforms play a vital role in your business? There are several things you need to consider when you are designing your employee uniforms. Be sure to ask yourself the following questions! What kind of restaurant do you own? Is it fine dining or family style? If it is a more laid-back environment, you can keep the uniform casual, such as t-shirts and khaki pants. If your restaurant high-end, you will need to invest more money into the uniforms. You will probably need to rent/buy collared shirts made from high-quality material. What Are The Colors Of Your Establishment? If possible make the colors inside of your facility go with the colors of your employee uniforms. If nothing else, you don’t want there to be a significant contrast in color. Also, it is a good idea to somehow incorporate your restaurant’s logo and colors into your employee uniforms because it will help with your branding efforts. Do You Want To Be Unique? Is there anything special about your restaurant’s employee uniforms? Is there anything that separates them from other restaurants? You don’t have to be basic when designing your clothes. Stand out from the crowd and be unique! For example, you can incorporate hats or cool shoes into your uniforms. Think outside the box and be original! How old are your staff members? What are their interests? These are the kinds of questions you are going need to ask yourself as a business owner. The demographics of your staff need to be a major consideration when choosing your employee uniforms. You will want to make sure that your staff to be happy with what they have to wear to work every day. The way to do this is to survey your team and keep an open mind. They should be able to provide you with all kinds of suggestions. For example, you may discover particular clothing items are currently trending and could be incorporated into your uniforms. This entry was posted on Friday, September 1st, 2017	at 12:14 pm	. You can follow any responses to this entry through the RSS 2.0	feed. Both comments and pings are currently closed.